Simultaneous analysis of multiple markers has been made possible with the development of a new method called cytometry by time-of-flight (CyTOF), or mass cytometry. With flow cytometry technology, one can simultaneously analyze up to about 20 different markers. This new CyTOF technology can simultaneously measure about twice as many different cellular markers than flow cytometry can. However, traditional flow cytometry still holds its place than this recent technology because, CyTOF is much slower and kills the cells during the analysis. Flow cytometry keeps the cells alive and thereby making it possible to sort the cells for additional assays. 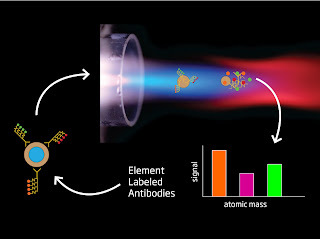 While flow cytometry also uses antibodies that bind to different markers, CyTOF differs in that the antibodies are tagged with heavy metal atoms that are usually not found in living cells, rather than with fluorescent markers. The labeled cells are then analyzed by mass spectrometry, which can differentiate more markers at the same time than flow cytometry because their signals overlap less than fluorescent signals.